Snakes. Some people love them, some people loathe them. 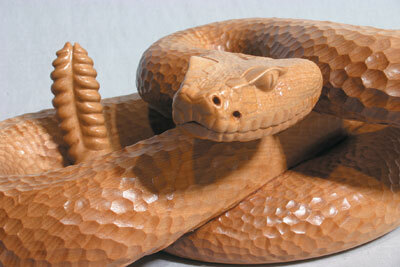 As I personally side with the former group, I have cared for and carved several different species in the past. 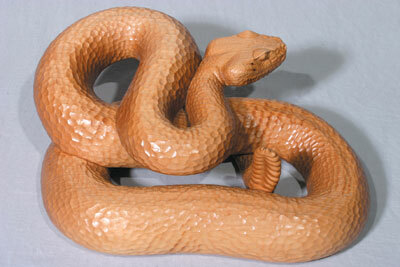 From some of these carvings, I have taken rubber moulds to produce limited edition bronze replicas. 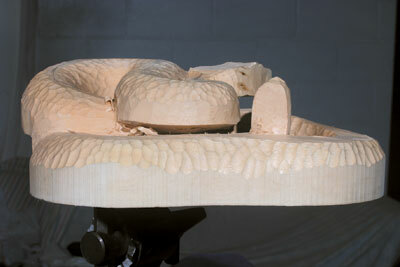 Unfortunately, the mould of one of my more popular snake sculptures - a rattlesnake - became damaged and unusable. 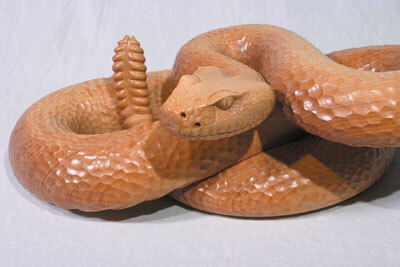 I had already sold the original, carved from English walnut (Juglans regia), so I decided to carve another rattlesnake in a different pose and take a new mould of that. 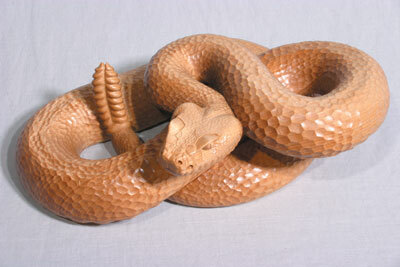 Snakes do have a beautifully sinuous body that adopts some very sculptural shapes, which can make for interesting, but not too taxing, carving. 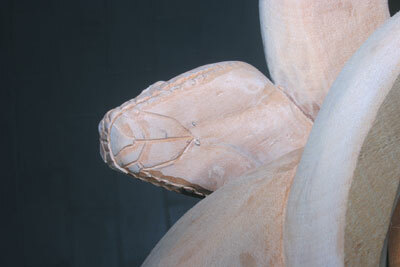 Although one is spared the carving of any legs, there is the issue of several thousand scales to cope with. But, by cheating a little with careful use of one's artistic licence, a scale effect can be achieved with less effort than it would take to apply a quality sanded finish. Whether a decision is made to follow the design outline below or to go with a plan of one's own, the process described could be relevant for either. Decide on a species of snake - in this case a western diamondback rattlesnake - and gather plenty of reference photographs - libraries and the internet can be good sources. 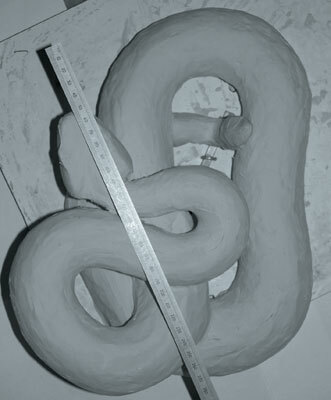 Produce a plasticine model from this reference material, preferably life-size, and make sure that the plasticine is not too cold when trying to work it - it is much more malleable if warmed slightly. 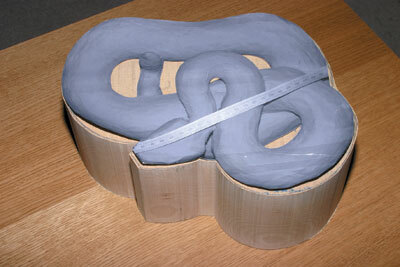 The good thing about working in plasticine before going near any wood is that one can keep on bending it and reshaping it until completely satisfied with the coils, turns, overs and unders, before committing it to the more unforgiving medium of wood. 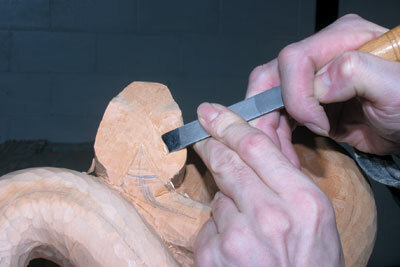 You don't need to sculpt-in vast amounts of detail, just the basic shape. Once happy with the design, photograph it from above (see figure 1). Notice the ruler in the photo - this just helps me when I am printing out or enlarging the image to get back to the correct size. 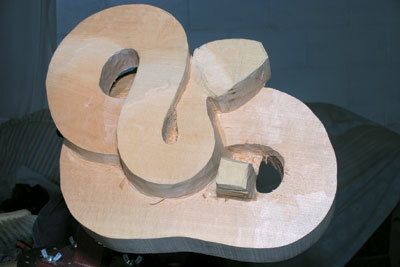 I decided to use a piece of lime (Tilia spp.) 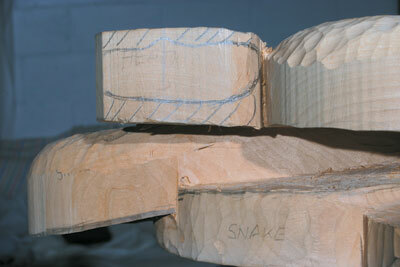 for this rattlesnake as it takes good detail, and was fairly easy to get hold of as a big enough block. Whichever timber you choose, make certain it is thick enough for the overs and unders of the body, and also for any lifting of the head. Cut out the full-size template produced from your photograph, lay it on your chosen wood, draw around the outline and then run around this line with a bandsaw (see photo 2). If no bandsaw is available to you, it just means you will be burning a few calories to remove this bulk timber with some well placed handsaw cuts and a bit of graft with a big gouge! 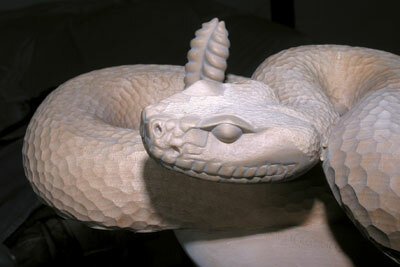 Referring to the plasticine model - or maquette - mark on your work the areas that you need to remove, but be certain to indicate areas that are to be left, such as the lifted head and the tip of the tail rattle. 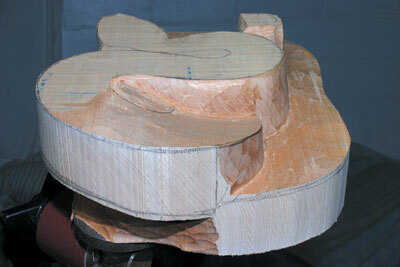 Remove the waste wood but at this stage, keep the body square. Don't be tempted to round things off too soon (see photos 3-8). The initial wood removal is achieved with a combination of a V-tool to outline, a No.6 20mm gouge - or thereabouts - to remove the bulk, and a flat tool to smooth everything off. Try to keep your work as neat and clean as possible. The vertical cuts down the sides of the body should be 90 degrees to the flat plane across the top of the back, and as crisp as possible. 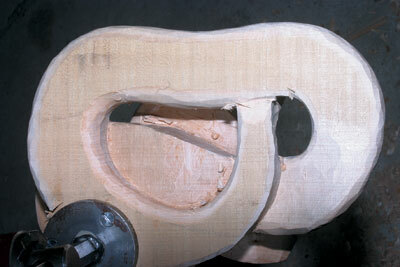 The tendency is to drift outwards from the original lines from the template, which will cause the pierced holes through the coils of the body to 'heal up'. Don't forget to attack it from underneath as well (see photo 7). 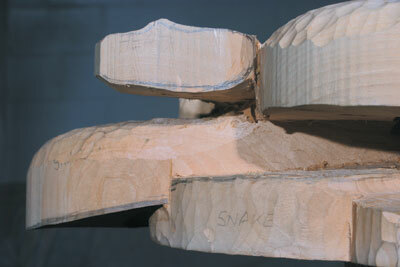 You can also see how I have screwed the fixing plate of my carving clamp into an area of the snake where the screw hole won't be revealed later in the carving - this would be very annoying. 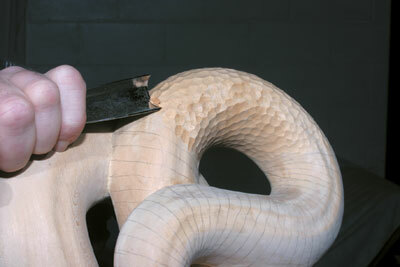 Once the squared off version of the snake is completed, (see photo 8), start rounding the body with a shallow gouge, both top (see photo 9) and bottom (see photo 10). Smooth over with a flat tool, then sand with a fairly coarse grain sandpaper to remove all tool marks. Snake bodies don't tend to be circular in cross-section; it is more like a rounded off triangle - narrow at the top, broader on the belly. 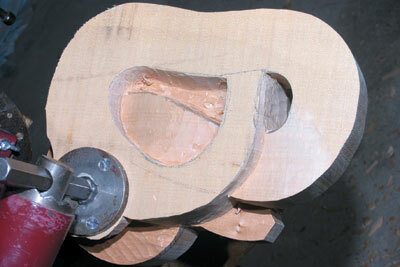 Refine the shape of the head area. At this point, you are beginning to move beyond the levels of detail in the maquette, so take note of your photo reference for the final detail (see photos 11-14). 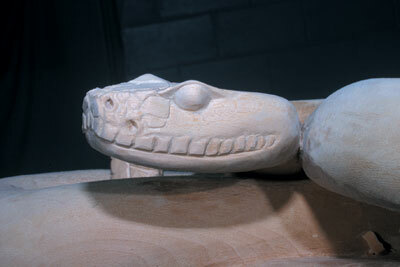 The head of a snake is bristling with sensory equipment: the eyes, nostrils and heat sensing pits, which are added to the carving (see photos 15-17). A scalpel or sharp knife helps when tackling the eyes, as does a small diamond burr in a mini-drill, when it comes to recessing the nostrils and heat-sensing pits. 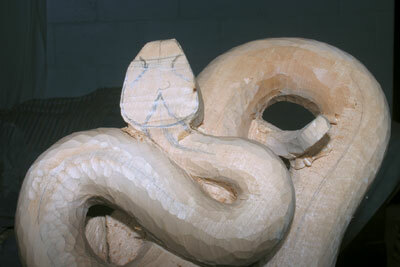 As the head is a bit of a focal point, I decided to carve 'proper' scales. 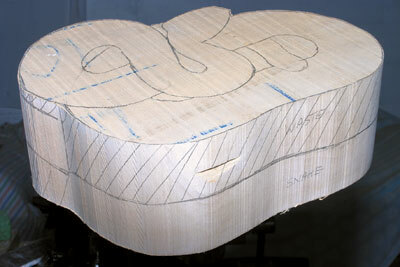 First, each one is drawn on in pencil; these lines are then run over with a V-tool, and each scale is individually shaped then sanded through grades 180, 240, 320 and 400grit abrasive paper, as are the eyes (see photos 16-19). 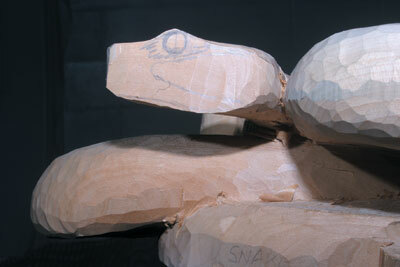 Similarly, the rattle on the end of the tail can be finished off. 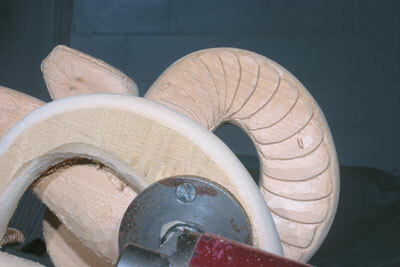 Each rattle segment is individually carved out with a V-tool, rounded by scalpel and then sanded through the grades mentioned above (see photo 20). 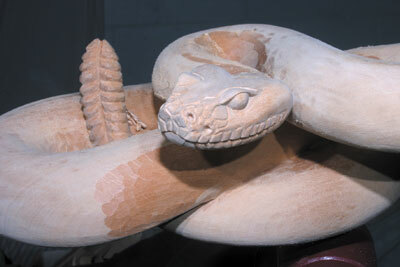 Where the body of the snake is lifted off the ground, the belly scales can be seen. These are large and heavily modified, so as to give the snake good purchase on the variety of surfaces that it may find itself. 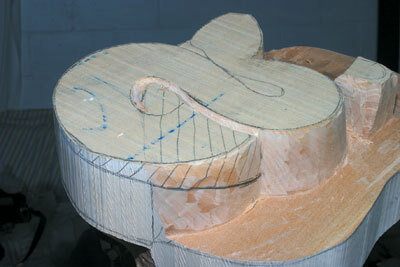 Carve these in with a V-tool after marking out. 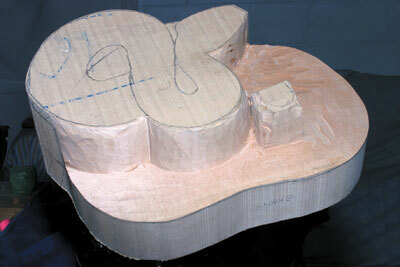 Angle each scale using a flat tool so that it appears to come from under the scale just in front of it. Lightly round the edges and sand smooth (see photo 21). Carving all the scales on the body in the same way as those on the head would take quite an obscene amount of time. In the past, I have given the overall impression of scales by carefully applying a tooled finished with two or three different sized gouges. I decided to use the same effect again. 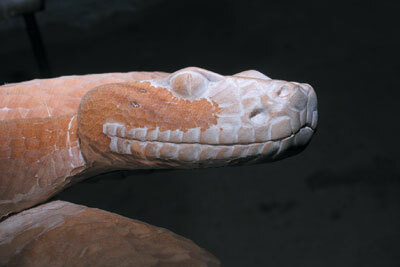 Scales tend to run in lines diagonally across a snakes body and not perpendicular to the line of the spine. To help get started, draw some diagonal lines on your snake as far apart as you want the length of your scales to be - this will vary. 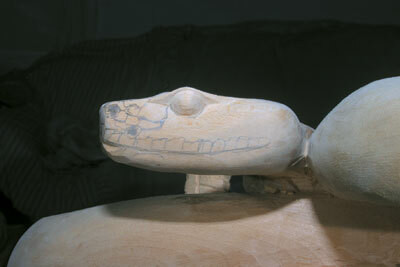 The scales start very small at the head end, get larger in the middle, then get smaller again at the tail end. That - unfortunately - is not all. The scales overlap each other like slates on a roof, from head end to tail end. When a snake bends, the inside of the bend - or coil - takes a shorter distance than the outside edge, relative to when the snake is lying totally straight when both edges would be of equal length. So to fill this extra distance, more of each overlapped scale is exposed. The consequence of this is that the scales appear larger on the outside edge of a bent snake and smaller on the inside edge. To achieve this look, radiate the diagonal lines you are drawing so that they are closer together on the inside edge of where the snake bends, and further apart on the outside edges (see photo 22). These are just guides to help when applying the individual tool marks to represent each scale. Make sure that your gouges are ultra sharp, and keep them that way with frequent honing or stropping. Keep the tool marks crisp and try to apply each one in a single scooping stroke. This stops lines being formed on the scales, which are caused if each scale is carved with more than one stroke. 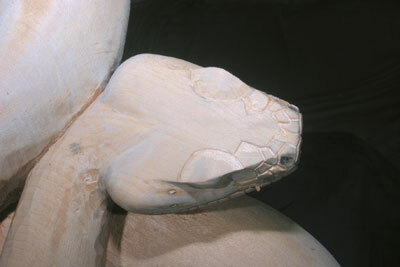 Continue these marks over the rest of the body, taking care with the very small ones around the head area (see photo 23). Finish the eye with the classic vertical slit iris of a reptile, with a single stroke from a sharp V-tool (see photo 24). 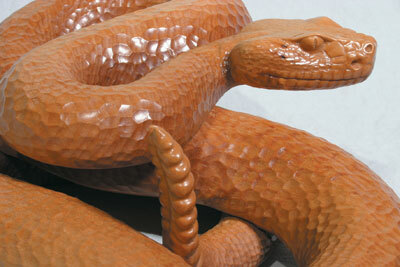 The completed snake is then given an application of finishing oil, which is left to dry overnight. It is then wax polished - using a neutral colour - and buffed to a soft sheen using a rotary bristle brush in a hand drill (see photos 25-29). "Snakes. Some people love them, some people loathe them"
Bill Prickett is based in Kent. He teaches woodcarving at Bromley Adult Education College and can also teach privately. For details of courses, ring 08707 406161.